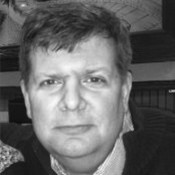 Christopher Button is the Associate Director for Planning & Construction at Hobart and William Smith Colleges. In his this role, he works hard to assure sustainability is incorporated into these efforts, and frequently works with faculty, staff, and students to make sustainability real. He enjoys teaching public speaking at the Leadership Institute at HWS, and believes that success happens through personal interaction, hard work, and good story telling. Chris is holds a BS and MPS in Construction Management from SUNY ESF at Syracuse, and has been a LEED AP since 2009. He shares a life with his stunning bride and three gorgeous daughters: a blonde, a brunette and a redhead! I was recently in SanFrancisco, and while there I became intrigued with Jack Kerouac, or at least who Jack is to me. The journey across SanFrancisco to his bar, Vesuvio, and the moments I spent with his ghost are priceless,endearing, and enduring memories. Experiencing the city through his eyes changed me, as every major city does, and should. My talk will be about how to find moments and events that leave lasting impacts on our lives. A focus point will be the importance of becoming more than we are for a moment, and then returning content to “normal” life, but just a little better because of it. The talk will share true life, interlaced with humor and feeling, and end with a call to explore at a deeper level!